"What temperature should I set my thermostat to for the winter?" Homeowners across the country ponder this question each year when temperatures start dropping. Answering the question, however, is not as simple as citing one specific temperature, especially as financial and energy usage concerns differ from one family and house to the next. If someone is at home in the daytime, 22° C (72° F) is a good start, but aim for 20° C (68° F). If everyone is away from home in the daytime, or you're asleep at night, we feel 19° C (66° F) to 17° C (62° F) is best. But instead of focusing a perfect number, you will benefit from establishing an energy-efficient winter heating strategy that will keep your home warm and your thermostat settings reasonable so you won't face large energy bills. Here are a few tips! Every home has its temperature preference, but setting the thermostat to that temperature and never changing it isn't helpful to your energy bills. Set your thermostats at that desired high temperature. Once you and your family acclimate to the colder weather, lower the temperature in the home by one degree each week. This one degree reduction - maintained for even eight hours - can reduce the home's energy bill by 1 percent, according to Energy.gov. Lowering the temperature further and preserving these lower temperatures for longer periods of time increases those savings, and you'll probably never notice the difference of such a slow, gradual change. There is no perfect winter interior temperature for every home, and the savviest homeowners realize there is no perfect temperature for every moment in their homes. Times when your home is left empty – such as work hours or traveling periods – present ideal opportunities to lower the temperature and reduce expenses. However, many homeowners miss this opportunity because they find constantly programming their thermostats too time-consuming. Others simply forget. 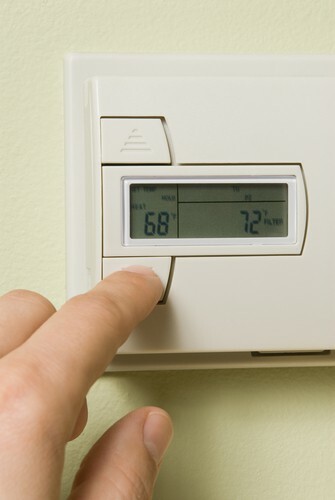 Programmable thermostats simplify the chore of creating optimal temperature settings. During the installation process, you can program your thermostats to deliver specific temperatures at set times of the day. These preferences can be programmed for weeks or months at a time. The specified temperatures can then be changed and adjusted by using the accompanying smart phone app. This allows homeowners to reset their home's temperature from anywhere. Optimal use of a smart thermostat enables homeowners to save as much as 15 percent on their heating bills, making this technology worth the initial time and monetary investment. Since you still want to reduce your winter energy expenses without feeling the cold, it pays to be creative. Close doors and vents to unused rooms makes it easier for the home's furnace to deliver the desired temperature to occupied living spaces. Seal cracks around the windows or door jambs. Bundle up. Dressing warmly, even inside the home, will make your family less reliant on the furnace, allowing you to turn down the thermostat another degree. Determining the perfect winter indoor temperature for your home is really a matter of supply and demand. You must measure your family's desired comfort against the price you're willing to pay for your winter heating bills. Employing the strategies above can help you find that comfortable winter thermostat setting, one that doesn't depend completely on your furnace and its associated expenses. Want to save even more? Sign up for an energy plan with Direct Energy and you'll get the tools you need to track your usage and stay energy efficient.